HMH Books for Young Readers, 9780618250769, 32pp. 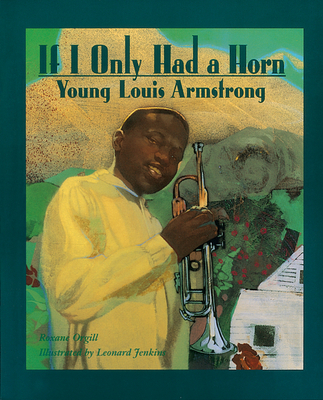 Roxane Orgill’s vivid words and Leonard Jenkins’s dramatic pictures combine to tell the story of a boy who grew up to be a giant of jazz—the legendary and beloved Louis Armstrong. As a poor boy in New Orleans, where music was everywhere—dancing out of doorways, singing on street corners, crying from the cornet of the great Joe Oliver for all to hear—Louis longed for a horn so that he too could sing, bring home pennies, and, most of all, tap happy-feet blues till the sun rose. It wasn’t going to be easy. Many things, not all of them good, had to happen before he got his horn. But when at last he did, he sent music spiraling up into the New Orleans night sky like a spinning top gone crazy. Painter Leonard Jenkins is also the illustrator of The Man Who Knew Too Much, retold by Julius Lester. He lives in New York City.